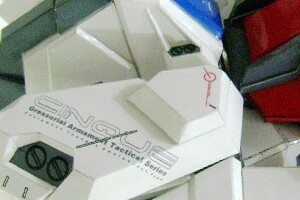 Rino has finish making and share the arm part of this Gundam Strike. As usual you have to look at PDO and photos below when assembly the parts. The arm template was designed to be articulated, but to be able to move Rino suggested to use magnets and if you want a fix statue you can glue all the parts. The next part will be the Beam Rifle. Photos below made by Rino using Art Card 190 gsm. 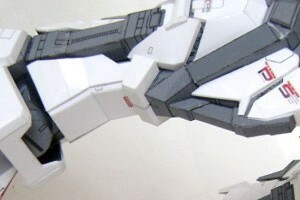 Rino finally email me the progress on his Strike Gundam template. He gave me a note about this template. Like usual the template is in RAR format, it contains 2 PDF files and 3 PDO. There are some parts that need additional glue tabs. He also advice to any builder to look both instructions in PDF and PDO files because the parts are potentially to be tricky and some joints could not be assembled if you place the wrong parts. In this template you don't need magnet like the previous one. On leg to waist joints it was advised to be modified if you feel it will not strong enough to support the upper body. Photos below assembled by Rino himself using 190 gsm Art paper. Question can be emailed to his email written in the template. This is an accessories part for the existing Sinanju Gundam paper model kit, which is the shield. 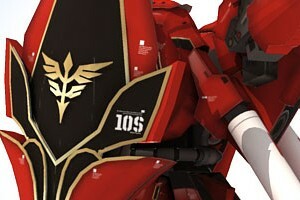 Sinanju's shield is quite long, about 80% of its the height from toe to its head. Templates consist of 12 pages for large version 68 cm and 5 pages for the small version 38 cm. After this release there is only one thing left to be made, that is its cannon. 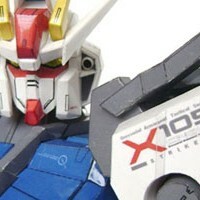 Newest part for Rino's Gundam Strike paper model kit has been release. This waist part consist of 4 files, 2 PDf templates and 2 PDO files for instructions that each file type need Adobe Acrobat Reader and Pepakura Viewer. Rino has some mistake on the template and he already include the patch for it in the RAR file. There are also some instructions that mentioning the use of magnet in several waist parts. All photos below build by Rino himself using Art Card 260 gram. Wanda makes a combo release. 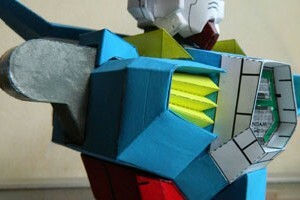 He released both torso and backpack for his Gundam AGE paper model kit. He also make it available templates for colored paper or blank templates. The photos below are test build by Wanda himself, the templates is slightly different from those photos, because Wanda in that time was using acrylic poster color because his printer is still broken. The templates and assembly instructions is separated, so don't forget to download both of them.